This post explains the backlash effect and how excessive reliance on force (as opposed to exchange and persuasion) can generate new enemies at a faster rate than existing enemies are defeated. This is a formula for losing the conflict! Are you aware of good and well documented examples of conflicts that were intensified and made more destructive by the backlash effect? Contribute your thoughts on both of these questions in Discussion #9. In this post I will explain a simple, but critically important, concept: something we call the” backlash effect.” It is something measured with what we call “the backlash coefficient.” The backlash coefficient is defined simply as the number of new enemies that you create in the process of defeating an existing—or old--enemy. A way to get a sense of what we mean by this is with a very silly little diagram that imagines all of the people that you're looking out at when you're involved in some sort of conflict situation. It could be the way the Iraqis or the Afghans responded to US intervention in their country, or a host of other similar kinds of things, as well as smaller scale situations down to the level of individual communities, and not involving any sort of violent confrontation. The basic idea is that there are four different kinds of people out there. First, there are the “green folks.” Those are the guys who are your friends and they are rooting for you and would like to see happen what you would like to see happen in the conflict. Then there are the “yellow folks.” They are the neutral face folks -- guys who don't quite know what to make of you. They might be your friend. They might be your enemy. They are sort of waiting to see how things go. Then there are the “red, frowny-face folks.” Those are the guys who don't like you. They don't agree with your agenda; they would like to see you lose, but, then again, you're not at the top of their priority list, so they are not going to actively fight you. Then there are the “purple screaming face folks.” Those are the guys who are so mad at you, that they're going to actively oppose you. In a military contest, these are your enemies--they may be insurgents; they may be terrorists; they may be a foreign army. These are the guys that if you're going to win a war, or some sort of political power contest, these are the folks that you have to defeat. So take the example of the early phases of our wars in Iraq and Afghanistan. Donald Rumsfeld, then our Secretary of Defense, thought that the backlash coefficient way less than one. So he argued that if we went after those three “purple screaming face folks,” –Saddam himself, his close family, and the insurgents-- and defeated them by either capturing them or killing them, that we would only anger other folks in the population enough to become active enemies at a rate of one out of three. So in this example, you take out three guys and you only create one new enemy. That's the formula for a war that you can win. So in this example, with the backlash coefficient being two, you have again the three screaming face folks--the insurgents that you want to get rid of--and you go and you take those guys out, but you do so in a way that creates six new enemies. That's the kind of war that you are going to lose! I had a student who was-- at least reported she was-- reasonably high up in the planning for either Iraq or Afghanistan (I forget which one), but she was telling me that they actually came to the conclusion that the backlash coefficient was 20 to 1! That obviously explained why, certainly in the earlier stages of those wars, things were going really, very badly. So the key is to figure out a strategy that minimizes the backlash coefficient. One option is not to try to take out your enemies with force at all, but to try to lure them to your side with incentives of various kinds—using carrots and not sticks. In the diagram, the blue circles are hugs, maybe. There are a whole range of strategies that are more in the realm of bribes than threats. Now this all applies to an earlier post that we had for the seminar series on the power strategy mix. One way to look at the power strategy mix is that it is a strategy for minimizing the backlash coefficient. So you're going to have a really high backlash if you treat everyone as if they are an incorrigible enemy. If you treat as many people as possible with other kinds of strategies based on persuasion (as you would for what we called “persuadables,”) and strategies based on exchange (which we used for “traders,)” and only use coercive force when absolutely necessary, that will go a long way towards limiting the backlash effect. It will also go a long way towards being much more successful in pursuing your goals in the conflict. 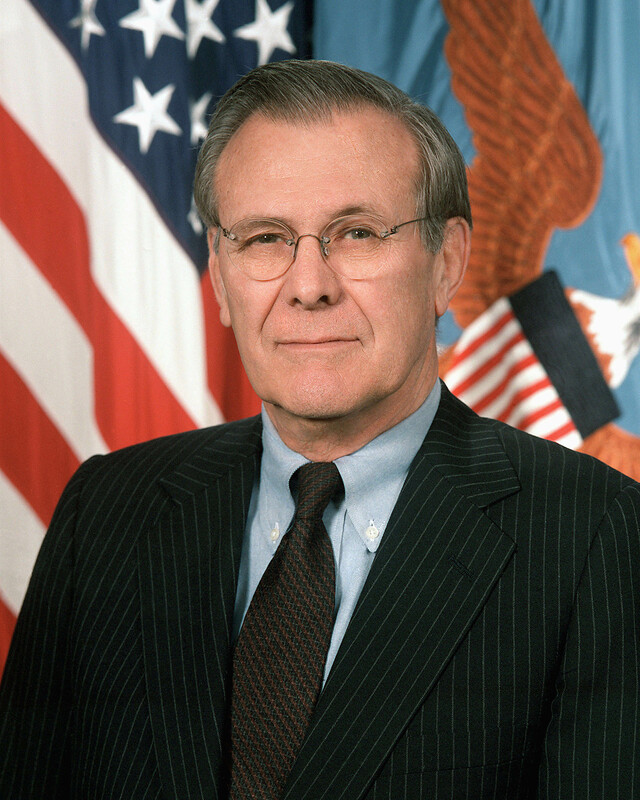 Slide 3: Donald Rumsfeld. By English: Scott Davis, U.S. Army [Public domain], via Wikimedia Commons.